Pat Sturgeon Yachts Ltd. has been in business since 1986. We realize that buying and selling a boat can be a long and complicated process with many issues popping up unexpectedly. At Pat Sturgeon Yachts we take the surprise out of the transaction by being upfront and accurate with the responsibilities of vendor, purchaser and broker. At Pat Sturgeon Yachts we sell brokerage boats as well as our line of New Boats; Hanse Yachts and J Boats, the best Performance Cruising and Racing Yachts in the World. We can also now add Moody Yachts and Dehler to the line of exciting New Yachts we sell. You can depend on us to find the right boat for you. If we currently don't have what you are looking for, we will search for the right boat and handle the transaction with a minimum requirement of your valuable time and effort. Contact our team of seasoned professionals to ensure your purchase or sale is handled properly. I recently bought a boat and used a broker for the first time. My experience with this broker has been nothing short of extraordinary and I felt compelled to reach out to your organization in attempt to recognize his great work. His name is Pat Sturgeon in Ontario. The boat that I purchased was not his listing (thus splitting the commission) and was not an expensive boat (1981 Bristol 35.5). Despite all of this, Pat has provided a phenomenal level of service and arranged things that I never expected. Perhaps this is common with your certified brokers, but I highly doubt it. Throughout the buying process he has anticipated my needs, alerted to me things I didn't know, and then handled all of them. His service and support has even continued after the purchased was completed! Please let me know if there is any sort of recognition you provide within your organization. Pat Sturgeon is a true star. After graduating from an extensive two year Yacht Studies program at Humber College, Pat took a full time position with Hughes Columbia until 1980, then with CS Yachts, running the rigging department in the winter months and heading up the service and commissioning during the sailing season. In 1984 Pat started with John Burn Yachts in Bronte as a commissioned salesman selling brokerage. In 1985 Pat, with a partner, bought out John Burn Yachts and continued to sell brokerage, forming Pat Sturgeon Yachts on his own in April, 1986. In 1994 Pat partnered with two time Olympian Hans Fogh to sell new JBoats and Schock sailboats. In 2005, Hanse Yachts Germany, aware of Pat's reputation in the boat business, approached them about representing their product line. 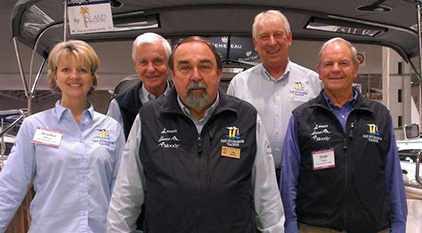 Today, Pat Sturgeon Yachts is one of the biggest boat brokerages in Ontario and, in partnership with Hans Fogh, are the sole dealers in eastern and central Canada for Hanse Group, including Hanse, Moody, Dehler and Varianta, as well having maintained their solid relationship as dealers for JBoats. Pat is a Certified Professional Yacht Broker and was instrumental in the formation in 2005 of Boating Ontario Dealers. Pat headed up the alliance between Boating Ontario Dealers and the CAC (Certification Advisory Committee for the CPYB) of which he is currently the chair. Pat has also been an active board member for Boating Ontario Dealers from its inception. Pat specializes in the import and export of yachts all over the world. He also is very in tune with current taxation issues around the purchase, sale and trade of boats. Pat is an advocate of co-brokerage relationships. Heather graduated with a BS in Business and Marketing from Marquette University in Milwaukee, Wisconsin. When she and her husband moved to Canada in 1989, she took the opportunity to stay home and raise their four children. Heather joined Pat Sturgeon Yachts in the spring of 2011 after working part time for an interior designer in Brampton and then Mosaic Marketing/Disney. When she's not working, she enjoys yoga, time spent with friends and family, and finding new ways to combat seasickness! Introduced to sailing by friends, Wally has spent many hours on the water, both racing and cruising far and wide. He has owned several boats and has sailed Lake Ontario and Lake Erie, as well as Georgian Bay and the North Channel. Traversing the Erie Canal to Newport R.I. and on to Block Island was a highlight. But for pure fun nothing beat dinghy/catamaran jaunts in Mexico and glorious Sydney Harbour. His enjoyment of all things sailing led him to a position in sales with the well-regarded Canadian builder CS Yachts. There he met Pat who had recently worked for CS and had left to start his own brokerage. After CS closed its doors Wally joined Pat as a broker. Wally holds a BA from York University and worked previously as a Systems Analyst. Don has been sailing and racing boats since his teens and has owned several boats. He presently has a 42' sloop. Don has sailed all the Great Lakes and the North Channel, as well as having sailed to Cuba and the Bahamas. In 2003, he had the experience of sailing from Nova Scotia to Portugal with some friends. Don joined Pat Sturgeon Yachts in 1994 after retiring from a full career in Law Enforcement. His knowledge of boats and his ability to keep his clients happy have kept him in the business for over 20 years. It is with great sadness that we announce Hans Fogh passed away peacefully from Creutzfeldt Jakob Disease on March 14, 2014 in Toronto. A fighter to the end, Hans leaves Kirsten, his beloved wife and safe harbour for 49 years, his two sons, Morten (Debbie) and Thomas (Andrea) and his grandchildren, Sarah, Curtis, Marcus, Kaia and Lucas. His guidance and friendship will be sorely missed. Known as one of the finest yachtsmen of his era, Hans Fogh is ranked among the world's top ten competitive sailors, with dozens of national and international championships, including two Olympic medals. Born in Denmark to a family of gardeners, Hans fully expected to continue in his family's business. However, while spending summers at a family cottage he fell in love with the sea and discovered the joys of sailing. Hans worked with Olympic and World Champion sailor Paul Elvstrom, fine tuning his sailing skills and learning the art of sail making. In 1960, he won the European Flying Dutchman title as well as a silver medal in the Olympics. Hans immigrated to Canada in 1969, becoming a citizen in 1975, thereby qualifying for the national sailing team. In 1984, he skippered the Canadian boat to a bronze medal in the Soling class and his 24-year span between medals still stands as an Olympic record. Pat Sturgeon and Hans developed a partnership in 1994 and Hans became involved in all new boat sails. His vast knowledge on how to make a boat perform has been a great asset to all new boat owners, as well as to Pat Sturgeon Yachts. Mark learned to sail at the age of 10 at a boy's camp in Northern Ontario. He received two degrees from the University of Waterloo, in Transportation/Transit and Environmental Planning including Environmental Science, and worked in that field with several firms in Ontario. In 1983 he turned to the sailing industry, working as Manager of the sales division of North South Yachting, selling Express and Tanzer Yachts, as well as being involved with the charter fleet in The British Virgin Islands. He also spent time within the sales department of C&C Yachts. Mark returned to his transportation profession and managed many transit projects within southern Ontario but in 2016 his love of all things nautical beckoned again and he joined Pat Sturgeon Yachts' sales team.